As I paw through my sons' Halloween candy stashes, I started thinking about the many ways that I can incorporate food into classroom math lessons. Aside from my previous posts, there have got to be a lot more ideas out there that I can steal. So I googled "Math + Food" and found all sorts of goodies. Happy eating! 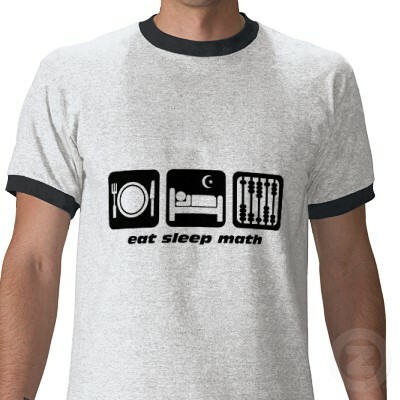 Oh and by the way I'm always looking for new math shirts... add this to my Christmas list, please Santa!?!? Probably a "medium" since it's Men's. Kay thanks. Pauline's 40 Ideas for Mixing Food and Math - I clicked on this first because I read it too fast and thought it said "Paula Dean's 40 Ideas"... Oops! Still good though. Maybe with less butter on top. My favorite is the geometric solids with toothpicks and marshmallows. Great for vertices and edges too! The air can be the faces. Vi Hart's Mathematical Food is by far the prettiest site I've been to in a while. Very good applications for musical / spatial learners. He has beautiful and tasty food applications, a blog, music clips and beadwork, and perfect for leftover Halloween treats - Sierpinski's triangle with candy corn! Measure geometric shapes and proportions with great ideas from Miss Celliana's Files. That bagel and the cheese look scrum-diddly-umptious. And I could see students making somewhat less advanced, but still yummy versions of the cupcake. Wondering if there are resources in print? Got some budget money left to burn? Check out FoodMaster. The goal is to integrate food science with math in a variety of settings. Current literature is for grades 3-5, but they are looking for partners interested in expanding to K-1 or middle school. We have an "Edible Classroom" student garden housed outside our school, and there are many opportunities to teach life skills here with seasonal foods. And now for something completely different! Math Goes Pop! The tag line says "Ruminations on the Intersection Between Mathematics and Popular Culture", and that's exactly what I'm seeing so far. There is a tab specifically for Math and Food, highlighting random tidbits like pricing mistakes, combo meal combinations, and Top Chef. 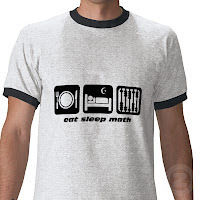 There are another 10+ sensational topics like "Animal Math" and "Math in the Movies" on their own tabs, to keep even a non-blogging math teacher and students intrigued for many a day. Yummy Math has a pile of food-related ideas as well, some of which I've never seen before. Along with interdisciplinary topics, sports ideas, business math, and the very random lessons on "anytime math". Enough food for thought. Which makes me hungry. For some pumpkin pi.